T’en es done bien coiffee du petit? A contemporary of Honoré Daumier, Paul Gavarni was a painter and prolific lithographer. The name Gavarni was a pseudonym that resulted from a mistake being made about his real name, Hippolyte Sulpice Guillaume Chevalier, during his early career. 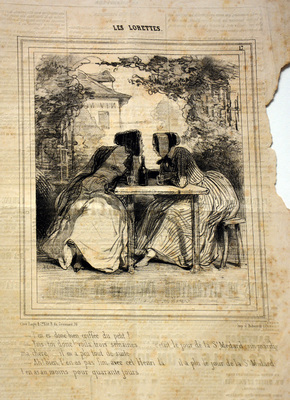 Beginning to make lithographs in 1824, Gavarni prints about fashion and contemporary life gained him recognition in the 1830s.